As Whitey Bulger, Johnny Depp (right) joins a roster of actors playing real-life villains. It was always going to end this way, of course. We all knew that. When people in America accrue enough fame, they enter the realm of folklore, which means they get turned into media. They get a movie made about them, or a TV show, or a song. This is how it works. Even if you kill a dozen people, give or take. That’s what we do as a culture. That’s how we explain a sociopathic little thug. We build him up until he’s legendary, and then we get a movie star to play him. We send our heroes to Disneyland, but the villains go to the big screen and to our memory banks, where they turn slowly into cartoon boogeymen and lose the dimensions of human evil. The specific awfulness of what they’ve done gets smoothed away, along with the names of their victims. I’ve seen “Black Mass,” but this isn’t a review of the film; that will be coming soon enough. Rather, it’s a meditation on the ways in which we reward infamy. It’s hardly a new thing. Actually, I’d argue that we’re hardwired as a species to tell stories around the campfire — actual or digital — about both heroes and villains. The heroes show us what’s possible if we’re strong enough, or smart enough, or lucky enough. The villains push more complicated buttons. On one level, their stories tell us what we can and can’t get away with if we want to live as part of a functioning society. You can be ambitious, aggressive, even brutal, but these narratives remind us that you have to play within the laws, that greed will always bring you down, and that Thou Shalt Not Kill. Brad Pitt as Jesse James. The folklore of our criminals and outlaws is predicated on endings, which involve either jail or — more viscerally satisfying and better for drama — a bloody and fatal comeuppance. The Whitey “story” didn’t wind down violently, but it couldn’t be satisfyingly told until Bulger was dragged in from the cold and put on trial for his crimes. The parenthesis needed to be closed for there to be a moral, for the values of society to be reestablished. You can’t make a decent movie about the criminal equivalent of Bigfoot. But we’re also drawn to outlaw sagas because we dream, however subconsciously, about the power that the unrepentant have, to go where they want, grab what they want, kill anyone in the way. The murder of a fellow criminal is fine in this context, even adds to the myth; innocent passersby, by contrast, detract from it. That’s one of the many reasons “Black Mass” will go down with a sour taste to many in the Boston area who remember the names of the unlucky: Deborah Hussey, Michael Donahue, Michael Milano, Debra Davis, among others. 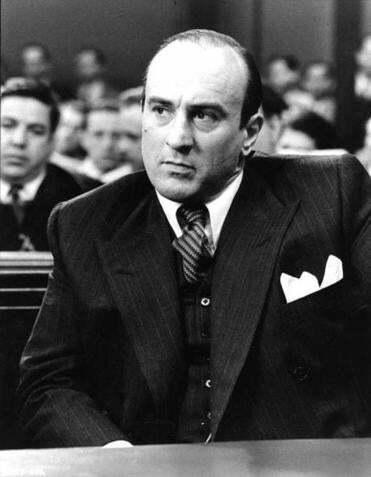 Robert De Niro as Al Capone. A crime movie lets us fantasize about being the good guys but more often the bad guys. They’re literally our projected monsters, acting out everything we’re too decent or law-abiding or timid to try. That’s why there are more movies about Al Capone than about Elliot Ness, why people remember John Dillinger more than G-Man Melvin Purvis. The American frontier is the great gray area where this first played out in our country’s popular imagination. Tales were swapped, newspaper stories were written, and pulp novels churned out in which sociopaths were remade into “legendary” gunslingers, and when the movies were invented, the folk antiheroes took naturally to them, too. The first film to tell the story of Billy the Kid came out in 1911; the character would go on to be played by Paul Newman, Kris Kristofferson, and Emilio Estevez, among many others. 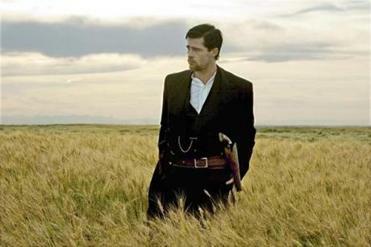 Jesse James has been, if anything, more popular: He has been played by Robert Duvall, Rob Lowe, Kris Kristofferson (again), Colin Farrell, Roy Rogers, Tyrone Power, and Brad Pitt. So it is with the bad men and women of the Depression. 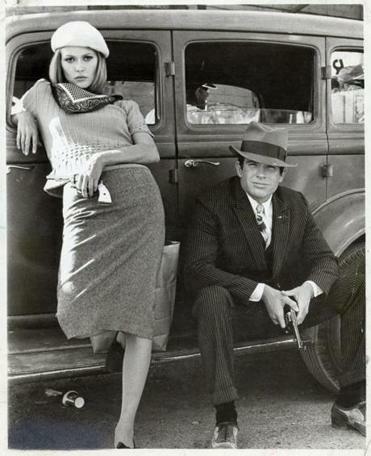 Warren Beatty and Faye Dunaway won the hearts of the rebellious 1967 youth audience as “Bonnie and Clyde,” and no matter that their portrayals had little in common with the actual Clyde Barrow and Bonnie Parker. Mickey Rooney played “Baby Face” Nelson, Charles Bronson played “Machine Gun” Kelly, Martin Sheen and Channing Tatum have played “Pretty Boy” Floyd. Dillinger has been portrayed, with sympathetic menace, by Warren Oates and Johnny Depp, among others; you could argue that Humphrey Bogart was doing Dillinger in 1941’s “High Sierra.” In 1991 alone, there was Dustin Hoffman as “Dutch” Schultz in “Billy Bathgate” and Beatty as “Bugsy” Siegel. And Al Capone? Who hasn’t played him? Robert De Niro in “The Untouchables” (1987) is the modern reference point, bashing in an unlucky associate’s head with a baseball bat, but Rod Steiger, F. Murray Abraham, Jason Robards, Eric Roberts, and Ben Gazzara have also played the role. That’s not even counting actors who played characters based on Capone. The question, then, with “Black Mass” is whether it’s “too soon.” Whether Whitey Bulger’s crimes are still so fresh from their airing in court that no movie about him can in any way qualify as “entertainment.” (There was Jack Nicholson in “The Departed,” of course, but that was a safely fictionalized version.) It’s an argument primarily rooted in geography, I think, because while a lot of people (I’m one) in the Boston area are bothered by the notion of Bulger finally and firmly entering the pantheon of mediated devils, that sense of acknowledging his real, human damage — of not wanting to lionize a creep — probably fades as you move away from the epicenter. In Minneapolis or Tucson, Whitey is just another Famous American Badass. Time will take care of the rest. It always does. Whitey Bulger will be dead soon enough, and so, eventually, will everyone who knew him, or wrote about him, or read the news about him, or got tired of reading the news about him. And then, like it or not, he’ll be a pure American myth, up there with Capone and Dillinger and even a make-believe figure like Paul Bunyan, just a murderous variant thereof, and the movies and TV shows will keep coming. This has nothing to do with who Jimmy Bulger is, or ever was. It has everything to do with the darker appetites of our imaginations. Correction: An earlier version of this story made an incorrect reference to Johnny Appleseed.